Over time, your automotive weatherstripping takes a beating from the constant opening and closing of doors, the rolling up and down of windows, and the inevitable forces of the elements. Although we would like to believe that certain things last forever, weatherstripping on your truck or car can wear out because of several factors — and the results are never too pleasing. Imagine sitting in the driver’s seat and getting soaked from water that has seeped through your window. Or what about opening the door to a musty smell or hearing a loud rush of air every time you get up to speed. Not only are the effects of poor weatherstripping annoying to experience, but they can also affect your vehicle’s performance and damage the interior of your automobile. Instead of using the classic solution of wrapping duct tape around any openings, you can trust Raybuck Auto Body Parts to arm you with the best auto body weatherstripping components. Weatherstripping is a rubber material that seals the edges of your vehicle’s doors, windows, windshield and other areas. Also known as “weather seals” or “weatherstrips,” they prevent outside elements such as rain, snow, wind and pests from reaching the inside of your vehicle. Weatherstrips even help keep your doors closed, your trunk sealed and your windows tightly wound. When you shop online at Raybuck.com you will find different seals for trucks and cars that fit perfectly on the make and model year you own. The purpose of a weatherstrip seal is to eliminate water leaks, wind noises, rattles and metal-on-metal contact. But when should you replace your rubber seals? Unlike having to replace them after a specific number of miles or number of months, the replacement of weatherstripping should occur as soon as the originals start to show any signs of wear. When you start to experience wind noise, leaks or other problems, you need to replace your seals. Replacement is easy for DIY automotive enthusiasts. However, it may be challenging to find exactly where the problem is. You can determine the location of leaks by using a hose to see where water is dripping or pooling. Even if the seal isn’t leaking, if it’s beginning to crack or peal, you will want to replace it before it starts causing issues. Vehicle weatherstripping falls into five main categories, including door, window, windshield, trunk and other. 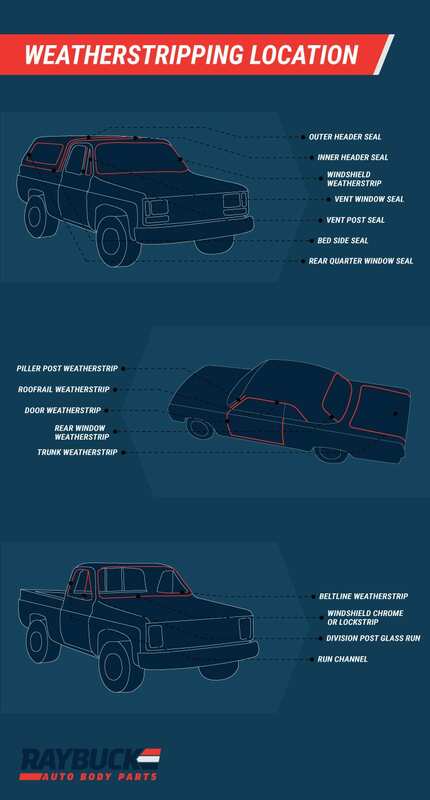 Now that you have a general idea of the various types of weatherstripping, here is a high-level overview of the type of weatherstripping that you can find on your vehicle. Automotive door seals attach to the outside border of your door and seal the door to the body of the vehicle. This weatherstripping keeps out wind, debris and water and also helps keep the door closed. Some door weatherstripping is held on with clips that snap into holes on the door. Other door weatherstrippipng is meant to be glued in place using an automotive weatherstripping adhesive. If there is a frame around the window, the rubber seal will have an “O” shape that surrounds the perimeter of the door as well as the window frame. But if there is no frame surrounding the window, then the seal has a “U” shape and attaches vertically to the rear and front of the door, then connects across the bottom. Some door seals mount to the body of a vehicle and others install onto the door. In most trucks, the weatherstripping attaches to both the body and the door. There are three types of door weather seals: glue, press-on and clip-on. They are vital for keeping out moisture along with wind and debris. Beltline: Also known as the “window sweep seals” or “window fuzzies.” You might even know it as “the fuzzy stuff at the bottom of your window.” Beltline are applied to each side of the door glass at the bottom. Made of rubber with felt-like material on the inside edge, they allow the glass window to roll up and down while keeping debris from falling into the door panel. Some mount onto the panels and others install onto the door shell. Vent window seals: Vent windows are the small, triangular or rectangular-shaped windows located in the front door just in front of the primary driver or passenger window. These are typically found in classic and antique vehicles as they have been phased out in most newer vehicles. The vent window requires two seals – the vent window seal and the vent post seal. The vent window seal mounts to that portion of the window frame on the door shell and the vent post seal mounts to the vertical division bar located between the primary window and the vent window. Window channel: Also known as “window run channel.” You apply them to the inside of a door window frame to act as a guide and seal for the perimeter of the glass. The seal also prevents the elements from reaching the interior, reduces rattling, and is made of soft rubber to avoid scratching the glass. U-Jamb seals, also known as “quarter window lock pillar seals,” are located at the front of the quarter window near the bottom corner. It’s also the frontmost and upper edge of the quarter panel, and the solid or hollow piece of rubber is often U-shaped. A U-jamb stays connected by screws, adhesives or clips to prevent debris and the elements from entering your automobile. Some SUVs also have quarter window vertical seals. These tend to be overlooked when it comes to weatherstripping. They attach to the front edge of a quarter window. Quarter windows are located between the front side window and the back portion of an suv. Windshield weatherstripping surrounds the entire windshield perimeter for water and wind prevention and to ensure the glass stays connected to the vehicle. Some cars have windshield weatherstripping laid on top of a windshield that’s glued to the car, while others have it installed at the same time as the windshield. The rubber component stays in place thanks to pressure from the glass, or adhesives or clips. Header seals: These span the top windshield frame and are on vehicles with convertible or Targa tops. The rubber piece seals the convertible’s top structure by running along the A-pillars, meaning they seal the windshield and door. Headers stay in place with glue, clips or screws. A-pillar seals: Also known as “windshield pillar seals,” these attach to the A-pillar, located at the side of the windshield. Its purpose is to seal the window frame or door glass to the windshield. Automotive weatherstripping replacements also include trunk seals that connect the trunk or deck lid to the body of the vehicle. Not only do they keep rain, snow, and wind from running into your back end, but the seals also help channel water toward the ground instead of letting it stay on top of your trunk and rotting it out. The seal keeps your trunk lid secured to the body of the car. Roof rail weatherstrips attach to the roof of a car where the window frame connects. The rubber part helps keep rain, wind, snow and dirt from trickling through to the interior of your vehicle. If your roof rails get damaged or are not installed correctly, you will often hear a great deal of wind noise while traveling. If you’re like us, DIY installation is probably your go-to method before referring to the experts when it comes to your vehicle’s weatherstripping replacement. When you follow a few short steps, you can ensure the process is quick, easy and productive. Glue-on: This kind uses an adhesive that attaches the strip to the entire door frame, the door opening on the cab or the upper door frame. Press-on: Press-on strips are made of a stiff material that presses over the flange. The channels hold the strip to the vehicle without clips or adhesives. Clip-on: These are made of rubber and attach directly to the door. Always make sure you line up the weatherstripping before final placement and press the clips firmly into the door openings. You can even apply a small amount of adhesive between the clips for extra support. Auto window channels come in two types and depend on the year, make and model of your truck or car. One-piece designs have a single channel that reaches from the rear of the glass and across the top and ascends down the front portion. A two-piece model has an upper channel that extends from the back side of the glass and along the top, with a division post that is vertical to the door glass. Remove the door panel and old weatherstripping. Lubricate the new rubber weatherstripping with a soapy water mix. If a vent window is present, disconnect it instead of totally removing it if possible. Line up the edges of the new strip with the corners of the door glass. Slide the piece inside the door and on the top part, making sure it’s in the channel. Every door has both an interior and exterior beltline weatherstrip. The outer one usually mounts using clips and rivets (in some older vehicles this strip pushes into a channel) and uses pressure against the window to stay in place. The inner weatherstrip mounts via clips or staples. Remove the door panel, roll the windows down, and remove the old beltline. Mount the outer and inner beltline strips by pressing the clips firmly into the slots. Vent seals are the trickiest installations and have a single-piece or two-piece design. One-piece vent window seals have a triangle shape and reach all the way around the vent glass. The two-piece variant has an “L” shape along with an unconnected post seal that installs vertically. Release the door glass and remove the vent frame. Take apart the vent frame system. Take out the glass and the worn weatherstripping. Lubricate the new strip with a soapy mixture and slide it into the channel. If you are working with a single-piece design, firmly press the seal into the division post. If you are installing a two-piece seal, you will have to attach the division post seal before reassembly. Install the vent frame back into the door frame. Weatherstripping and rubber weather seals are not one size fits all. For different makes and models of trucks and cars, Raybuck Auto Body Parts has an inventory of customized seals to suit your vehicle’s exact year, make and model. We back up the quality and finish of all our weatherstripping components, which range from door seals, belt lines and windows to windshields and other seals. Your car door seal weatherstripping is due for replacement any time you can feel or hear air flowing through the door or if you experience leaks when it rains. We partner with suppliers that deliver high-quality materials that fit your specific application and vehicle. Our professionals also recommend cleaning the surface with wax or grease remover before application to enhance adhesion. Replace your car window sweeps when leaks start to appear or when you can hear air flowing through the cracks. We have a wide inventory of gaskets, channels, and seals to keep the elements out of your truck or car using top-quality rubber. The inside beltline of your window runs along the top of the door panel while the outer one goes along the outside of the window. Replace your beltline weatherstripping with our interior replacement parts today. Why Buy From Raybuck Auto Body Parts? Raybuck Auto Body Parts is a leading supplier of auto body panels and interior parts in America. We dedicate our time and passion to honing our product line to offer superior products. We are truck people like you, so we only partner with high-end suppliers. We get it. We offer competitive prices to keep our DIY truck lovers and auto shop partners on track. Whether you need to replace the rubber seal on your trunk or your windshield, we’re here to help you keep your vehicle dry, comfortable, safe and annoyance-free. Weatherstripping is a commonly neglected part of routine vehicle maintenance. Don’t wait until you’re sitting on a soppy seat, smelling a musty odor for weeks or listening to the wind in your ear during long trips — purchase the weather stripping replacements you need from Raybuck Auto Body Parts. Shop our products online today, whether you need door and window strips or you’re looking to replace all the rubber components on your truck in one go. We provide affordable alternatives to OEM parts that deliver the most reliable quality you’ll find anywhere.